If you need more storage space for you digital files, you want to backup your data, or you want to able to share files between multiple computers then an external hard drive is for you. When deciding to purchase a new drive some of the factors you should consider include the storage capacity, transfer speeds, portability, and durability. Prices range from around $50 to over $500, however many good options are available for under $100. We evaluated dozens of models to come up with our list of the top 10 best external hard drives. Below these external hard drive reviews we have a comparison chart so you can easily compare one drive versus another. If you need more advice or help see our External Hard Drive Buying Guide. We chose the $107 500 GB Samsung T5 Portable SSD as the best external hard drive. We love everything about this drive since it is small, lightweight, fast, and shock resistant. This Samsung unit also seems to be much more reliable, with fewer failures, than most other external portable drives. With the USB Type-C (USB 3.1 Gen 2) connector it has transfer speeds up to 540 MB/s. The T5 also has optional password protection and AES 256-bit hardware encryption. The Samsung T5 Portable SSD is perfect for anyone who wants fast, secure external storage. It comes in 250 GB, 500 GB, 1 TB, and 2 TB versions. 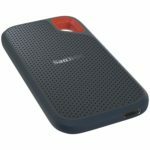 Another outstanding SSD portable external drive is the SanDisk 500 GB Extreme Portable External SSD which sells for about $100. This thing is IP55 rated for water and dust resistance while also being shock and vibration resistant, in fact it can withstand a two meter drop onto concrete. This SanDisk drive is a bit longer than the Samsung T5 but it is thinner and lighter at just 1.44 oz. It also has a USB Type-C connector with the USB 3.1 Gen 2 interface with a max speed up to 550 MB/s. It has password protection using 128-bit AES encryption. We would not hesitate to recommend the SanDisk Extreme Portable External SSD for any users who want fast transfers and some rugged protection. It is also available in 250 GB, 500 GB, 1 TB, and 2 TB versions. If you are looking for an affordable external portable hard drive and we recommend the WD My Passport. The 2 TB version sells for about $70, while it is also available in 1 TB, 3 TB, and 4 TB sizes. While it is not nearly as fast as solid state drives, the My Passport HDD uses a USB 3.0 interface with max transfer speeds of about 174 MB/s. However, you will rarely reach those actual speeds. My passport is also very small and lightweight which makes it great for portability, however there is no shock or drop protection. It comes with auto backup software and built-in 256-bit AES hardware encryption with password protection. Overall the WD my passport is great for basic backup and storage when price matters more than speed. If you want a portable external hard drive that is a bit more rugged then we recommend the Silicon Power Armor A60. This thing is military-grade shockproof and IPX4 water-resistant. With a price of $72 for the 2 TB version it is only a few dollars more expensive than similar drives that do not have any extra protections. Weighing 11.2 oz it is just a bit larger than the WD my passport. It uses a USB Type-C connector with the USB 3.1 gen 1 interface. It comes in 1 TB, 2 TB, 4 TB, and 5 TB versions. Another cheap portable external hard drive is the Toshiba Canvio Basics. The 2 TB version sells for $65 and has specs very similar to the WD my passport. This thing is extremely basic with no backup software or password protection included. The Canvio Basics uses a USB 3.0 interface with a 5400 RPM hard drive in its core. The Toshiba Canvio Basics comes in 1 TB, 2 TB, 3 TB, and 4 TB models. It makes a good choice for anyone who just needs simple backups or extra storage space. We selected the Seagate Backup Plus Hub as the best desktop external hard drive. It has the lowest per GB cost of storage of any external hard drive with a cost of .022 per GB when you purchase the 4 GB version for $90. This thing has a 5900 RPM HDD that when combined with the USB 3.0 interface provides higher transfer speeds than most other desktop external drives that are not SSDs. Be aware it is powered by a power adapter, but it does have two forward facing USB 3.0 ports so you can charge other devices while you work. The Seagate Backup Plus Hub comes in 4 TB, 6, TB, 8, TB, and 10 TB versions. 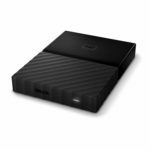 Overall it is a great choice for use as a desktop external drive for anyone who needs lots of space for storage or backup. 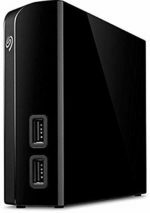 Another cheap desktop external hard drive is the WD Elements Desktop Hard Drive which is tied for the cheapest external hard drive cost per GB. The 4 TB version will set you back just $90. The 10 TB version is the best selling external hard drive on Amazon. The Elements Desktop Drive is very basic with no extra features like software or security. It has a 5400 RPM hard disk drive, USB 3.0 interface, and it is powered by a power adapter. 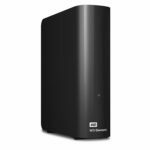 If you need a cheap desktop external hard drive then you should consider the WD Elements Desktop Hard Drive which is available in 4 TB, 6, TB, 8, TB, and 10 TB capacities. The cheapest portable external hard drive is the WD Elements Portable External Hard Drive which costs just $63 for a 2 TB version. It is also the best selling portable drive on Amazon. This drive is also just a very basic model with no extra security features or software. It uses the USB 3.0 interface, has a 5400 RPM HDD, weighs 7.8 oz, and comes in 2 TB, 3 TB, or 4 TB versions. 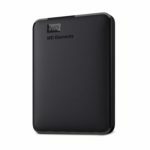 The WD Elements Portable External Hard Drive is for those of you who simply need the cheapest portable external hard drive you can get and don’t need super fast transfer speeds. If you need a desktop external hard drive with RAID storage then we recommend the WD My Book Duo Desktop RAID External Hard Drive. The 4 TB version costs $259. It is configured for RAID-0 right out of the box. The nice thing about this enclosure is you can replace the drives if needed or upgrade them if you want. The WD My Book Duo is powered by a power adapter and has a USB Type C connector with a USB 3.1 Gen 1 interface. It also has two USB 3.0 Hub Ports for your use. Transfer speeds top out at 360 MB/s. It also comes with 256-bit AES hardware encryption and password protection. 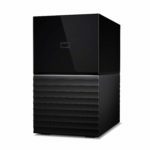 The WD My Book is an upgrade from the WD Elements Desktop Hard Drive, but it will cost you more money. The 4 TB version costs $100. It is powered by a power adapter and has a USB 3.0 interface with transfer speeds that top out at about 163 MB/s. The WD My Book comes with WD Backup software, password protection, and hardware encryption. The drive is available in 3 TB, 4 TB, 6 TB, 8 TB, and 10 TB capacities. Desktop – External desktop hard drives are designed to be used with your standard desktop computer where it will normally stay in one place although it can be moved. This type of drive usually has more storage capacity and is cheaper per GB of storage, but it is also larger in size and will usually have a separate power adapter. Portable – Portable external hard drives are normally meant to be used with laptops or any computer where you need to the ability to easily transport the storage device. They are smaller and are normally powered by a USB cable, but are usually more expensive per GB of storage than desktop models. Wireless – Wireless external hard drives are portable units that provide an onboard Wi-Fi connection so you do not need a cord to connect to your device when transferring files. Wireless storage expanders are especially useful with tablets where you have a limited internal storage capacity, but you would still like to have your entire video and music collection with you. Network Attached Storage – A network attached storage (NAS) device connects to a network instead of an individual computer and acts as a shared drive for backing up data and sharing files across your entire network. Some of these units provide advanced features like media streaming and you can find models with multiple drives that allow for more capacity and greater protection for data. These are much more expensive and larger than a typical external drive. SSD (Solid State Drive) – SSD is a type of hard drive. It offers much faster performance and reliability, but also costs a lot more than average and usually has much less capacity. It is recommended for anyone who needs faster transfer speeds or who wants less of a chance of failure since it has no moving parts. In simple terms storage capacity is how much data your drive can hold as measured in gigabytes (GB) or terabytes (TB). 1 TB is equal to 1000 GB. Current external hard drives range from about 250 GB up to 4 TB or more. Users who have a large video or music library probably will want at least 1 TB to 2 TB. If you don’t have a lot of media files to hold, you can get away with a drive having less storage. If you are backing up your data, you should get a drive with at least as much capacity as your internal hard drive on your computer. The transfer speed is how fast data can transfer to and from the device as measured in Megabits per second (Mbps), Megabytes per second (MB/s) or Gbps (Gigabits per second). 1000 Mbps is equal to 1 Gbps. The more often you backup or transfer files, the more of a priority should be placed on the speed. There are several different connectors and interfaces that determine how fast your unit is and the external drive and computer must have compatible connectors to maximize speed. A Thunderbolt 3 connector is the fastest connection available at up to 40 Gbps, but is also the most expensive and not as widely used. USB 3.1 Gen 2 is the fastest USB connector at 10 Gbps. USB 2.0 will be the cheapest, but has the slowest speeds of 480 Mbps. If your drive has a USB 3.0 connector, but your computer is only USB 2.0 compatible, then the speed of transfer is only at the USB 2.0 speed. Getting a small, portable unit is advisable if you need to transport your drive constantly. Smaller models cost more, but some are small enough to fit in a pocket. Make sure you also get one that is powered by the data cable so you do not have to have an outlet. Hard disk drives (HDD) are more prone to shocks, vibrations, moisture, and heat than SSDs. Some units come with cases that provide physical layers of protection for the drive in case you drop it or to protect it from heat and moisture. If you work in in a rough environment then one of these models might be for you. Many units are built for use with either the Apple ecosystem or for PC’s. These will work right out of the box for you with the correct hardware. Some models will work with any hardware, but may require you to reformat the drive before using it with a specific internal hard drive. Make sure the storage device you buy is compatible with your operating system.